Australian Tanks operates within an externally and self-assessed quality management system to meet the requirements of AS/NZS ISO 9001. We are devoted to ongoing growth and improvement in all aspects of the business and in particular our Environmental and Health and Safety Management Systems to meet the requirements of ISO 14001 and AS 4801. Regular internal and external auditing is carried out under the terms of the third party accreditation. 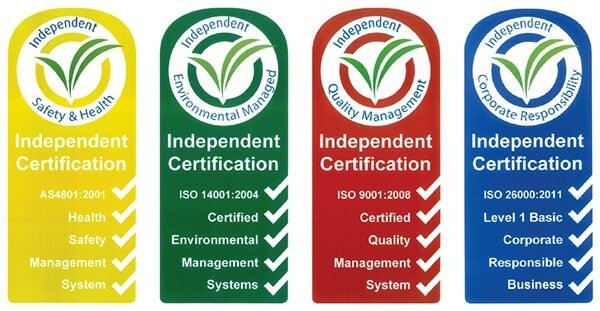 We also pride ourselves on being a Corporate Responsible Business and hold ISO 26000 certification.